Biomarkers for R&D of type 2 diabetes and cardiovascular diseases: adiponectin et. al. - Advanced ImmunoChemical Inc.Advanced ImmunoChemical Inc.
Home » Article » Biomarkers for R&D of type 2 diabetes and cardiovascular diseases: adiponectin et. al. Adiponectin is an abundant hormone secreted by adipocytes. It appears to have many functions in organisms, however, the main function of adiponectin is most likely the regulation of glucose metabolism. Adiponectin is an insulin-sensitizing hormone that has been extensively studied as a prognostic and diagnostic marker of diabetes and cardiovascular diseases. Low blood adiponectin levels are associated with the increased risk of metabolic syndrome and the development of insulin resistance. Moreover, decreased levels of adiponectin have been found in patients who suffer from Type 2 diabetes mellitus or coronary artery diseases. 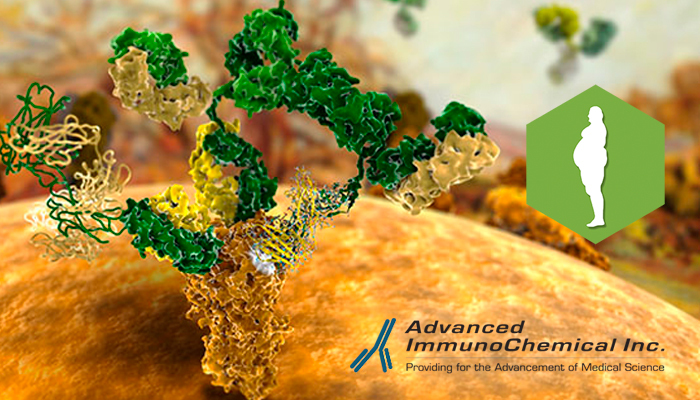 At Advanced ImmunoChemical, Inc., we offer several monoclonal antibodies that enable the development of immunoassays with different specificities to the various oligomeric forms of adiponectin – LMW, HMW and total – that are found in blood. In addition, we provide purified native adiponectin protein preparation which can be used as a calibrator in immunoassays. For more information and pair recommendations, see our Adiponectin AssayNotes. Schematic representation of adiponectin oligomeric forms. Additional markers for studying diabetes and obesity from Advanced ImmunoChemical. HbA1c. A number of studies have shown that glycated hemoglobin (HbA1c) concentration provides a better estimate of average hyperglycemia than routine determinations of blood glucose concentration. HbA1c measurement in diagnosis of type 2 diabetes has been recommended by American Diabetes Association, World Health Organization and International Diabetes Federation. Proinsulin, insulin and C-peptide. Assays for proinsulin, insulin and C-peptide are widely used in the monitoring of hypoglycemia, pathogenesis and treatment of diabetes mellitus. Insulin is synthesized in the pancreas from its precursor proinsulin. During this process, proinsulin is proteolytically cleaved into three peptides: A- and B-chain and C-peptide. A- and B-chains are covalently linked by disulfide bonds to form mature insulin. Analysis of proinsulin synthesis and processing, as well as insulin and C-peptide clearance, are very important for the improved understanding of carbohydrate metabolism abnormalities. Assays for insulin, proinsulin and C-peptide are widely used in the monitoring of hypoglycemia, pathogenesis and treatment of diabetes mellitus. Leptin and ghrelin. Leptin and ghrelin regulate food intake and their functions in obese people have been intensively studied. We offer monoclonal antibodies against leptin and ghrelin for research purposes. Reference: Kogan AE, et al. (2013) Oligomeric adiponectin forms and their complexes in the blood of healthy donors and patients with type 2 diabetes mellitus. J Immunoassay Immunochem. 34:2,180-196. doi: 10.1080/15321819.2012.699494.